Once again, Halloween is fast approaching. With a nip in the air, the dark night’s drawing in, and of course, the inescapable sight of pumpkins everywhere. While many will be bought alongside the weekly food shop throughout October, few of them will actually be eaten. Many, if not most, will only be carved for decoration and eventually discarded when the holiday is over. Research shows that out of the 1.8 million pumpkins carved in Scotland a year, a staggering 1.1 million are thrown away. Such disheartening practices bring to mind the old Scottish proverb, ‘Wilful waste makes woeful want’. Such wilful waste of a perfectly good pumpkin probably would have seemed quite shocking to the inhabitants of the closes and wynds of Edinburgh in the seventeenth century, and this was for two important reasons. Firstly and quite simply, if seventeenth-century Scots came across pumpkins, they were far more likely to have been set before them in a colonial tavern as a savoury pumpkin pie or made into pumpkin beer rather than. However, it was also a time of severe food shortage. Indeed, the sage advice offered by the proverb would have taken on great importance in the early years of the marriage of one of Edinburgh’s most famous daughters, Mary King. Within five years of marrying the merchant, Thomas Nimmo, a national crisis created widespread hunger. When harvests failed in the autumns of 1621 and 1622, a dramatic famine or ‘dearth’ followed, making food scarce even in the capital. The council took steps to review ‘the present supply of the weak poor within the burgh’. Famine refugees flocked to Edinburgh from ‘all other parts of the country’, causing fear and confusion in the streets. In response, voluntary contributions were collected in the Kirk, and council discussions turned to the problems of the dealing with the situation. In such a context of woeful want, it is highly doubtful that there would have been food enough for decoration, even for a fairly well-to-do family, like that of Mary King. One can only wonder what Mary King and her neighbours would make of carving faces into pumpkins and simply discarding the remains. That’s why we are so pleased to support Zero Waste Scotland in their delivery of the Love Food Hate Waste Halloween initiative this year. If you head over to their website they have so many innovative ways to make the most of your pumpkins this Halloween season! 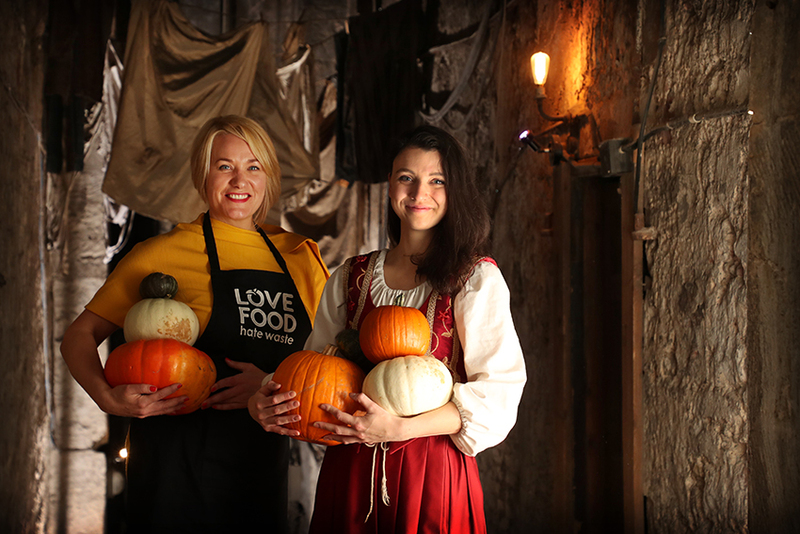 The Real Mary King’s Close in Edinburgh is running Halloween tours throughout October to take visitors back in time to the infamous witch trials. Guests will learn how Mary King’s Close residents were implicated, and the fate that befell them.